Just when we thought the Manny Machado sweepstakes was coming into focus, more teams have jumped into the mix and complicated things. A few days ago, we thought there were seven teams in the running, but now the Yankees and Red Sox seem to have put their hats into the ring. Recent reports indicate the Baltimore Orioles have as many as nine offers for Machado to sift through. With less than three weeks until the trade deadline, let’s take another crack at figuring out where Machado will end up. There’s no doubt that the Brewers would love to add Machado. They have not been enamored with the offensive production of their middle infield this year. There are also rumors of an offer in place that involves pitching prospect Corbin Burnes, shortstop Orlando Arcia, and outfielder Keon Broxton. If true, that would be a nice haul for Baltimore and could be enough for the Brew Crew to get Machado. The Dodgers continue to be one of the top favorites to land Machado. He would be purely a rental player with Corey Seager out for the season. By all accounts, the Dodgers are keeping in contact with the Orioles. There’s also no doubt they have the prospects to get Machado if they want. Machado to Arizona would make a lot of sense. The Diamondbacks have a real chance to win the NL West, especially with another big bat in their lineup. However, Arizona doesn’t have a strong farm system, so they could struggle to make the Orioles a strong offer. There is also less chatter connecting the Diamondbacks with Machado than there was a few days ago. The Phillies aren’t going anywhere as far as the Machado rumor mill is concerned. They want him right now and beyond, as they figure to be serious players when Machado hits the open market this winter. It’s taken Philadelphia a long time to rebuild, so they may not want to put a dent in their farm system for a high-priced rental. That being said, the Phillies should have enough young talent to get a deal done, so they should be considered serious contenders. The Red Sox have worked their way into the Machado conversation in the past few days. Third baseman Rafael Devers going on the DL Thursday should only fuel that speculation. Machado has mentioned that he doesn’t want to play third base, which is likely where he would play in Boston. Of course, he doesn’t have much say in where he gets traded. For now, the Red Sox are more on the periphery, but that could change. The Yankees are suddenly major players in the Machado trade talks. The mere mention of the Bronx Bombers having interest in Machado made them favorites to get him. 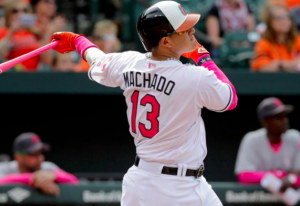 There are reports that the Yankees made a “strong offer” for Machado, although that offer didn’t include pitching prospect Justus Sheffield of young outfielder Clint Frazier. They may have to include at least one of them in order to make the Orioles bite. Then again, New York’s farm system is awfully strong, so they may be able to put together an enticing offer for Baltimore. The Braves, Cubs, and Indians all appear to be losing steam in the Machado sweepstakes. However, it’s possible that all three teams have made offers to the Orioles. All three should be considered a long shot at this point. That being said, things are a lot different than they were a week ago. It also doesn’t seem like anything is imminent, so even the long-shot teams can’t be ruled out completely just yet.